Defenestration, defined by Dictionary.com, is "the act of throwing a thing or especially a person out of a window". 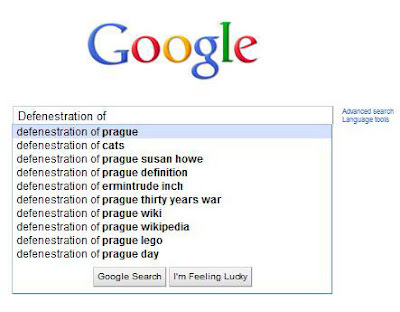 When you look up 'Defenestration of' on Google, the results will almost fully be about Prague, apart from a short story by Arthur C. Clarke and the defenestration of cats. Prague is famous for its defenestration, but there was not just one defenestration, but multiple. Prague had two major defenestrations. The first defenestration occurred shortly after the death of John Hus. John Hus (1370-1415) was a religious reformer and philosopher from Bohemia who accused the Catholic Church of being the cause of a deep social crisis. Hus wanted the Church to return to the original mission of the Church and to spread God's word and live according to the Biblical commandments. Hus also attacked the Pope's lifestyle and saw Jesus Christ as the head of the Church. Hus was executed for refusing to recant his criticisms of the Church. When the news of Hus's death in 1415 arrived at the Council of Constance, the populace was furious and attacked the clergy, especially the archbishop and the monks. Followers of the teachings of Hus became known as Hussites. On July 30, 1419, a Hussite priest named Jan Zelivsky led a procession to Prague's New Town Hall to protest the imprisonment of Hussite prisoners by the councilors of Prague. When an anti-Hussite threw a rock at the protesters, the Hussites stormed the New Town Hall and threw the seven councilors out of the window. The defenestration started the Hussite Wars, which lasted until 1436. The second Defenestration of Prague occured in 1618. In 1617, Roman Catholic officials ordered the halt of the construction of Protestant chapels in a land the Catholic clergy claimed. The people claimed that the land belonged to the king and that they were free to use it. The people saw this act as a violation of freedom of religous expression and feared that it was the first step towards annulment of Protestant rights. The Czechs had already had enough with Catholicism. The Hapsburg Dynasty fought a long war to subdue the Czechs andprtests against Hapsburg rule and Catholicism were frequent. Leaders of the Czech estates, including Jindrich Matays Thurn and Vaclav Budovec met to forcefully remove governors Vilem Slavata and Jaroslav Borita. The men led an angry mob into the Bohemian Chancellery, found theimperial governors guilty, and threw the governors out of a 16 meter high window. Nobody, including their scribe, was spared. The two governors landed in a pile of manure and everyone survived unharmed. The scrive, Filip Fabricus, fled to Vienna and informed the emperor. The emperor had appointed the Catholic Emperor Fredinand II ad the King of Bohemia in 1617. The Czech aristocracy revolted against this, and in 1920, at the Battle of the White Mountain, the Protestant estate was defeated. The Czech noblemen were refused a pardon and over 200 of them were sentenced to death. This defenestration would lead to the absolutist monarchy of the Czech estate and would eventually lead to the Thirty Years' War. There were other defenestration, but these other ones were not important to cause wars. These other ones occurred on September 24, 1483 and March 10, 1948. All these defenestrations add to Prague's rich history, and to end this post I give you 1 warning: Do not make the people of Prague angry. Simple theme. Theme images by lisegagne. Powered by Blogger.